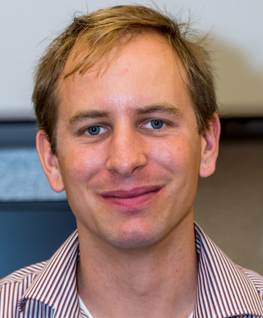 Timothy Sheils is a research scientist in the informatics group within NCATS’ Division of Pre-Clinical Innovation. He currently is involved in creating websites for various NCATS projects, as well as assisting in updating current sites. Sheils’ recent projects include collaborations with the Food and Drug Administration to create a global substance registration system, called the Global Ingredient Archival System (GiNAS), as well as a system to capture the experiences of clinicians repurposing drugs to treat rare diseases, called the Collaborative Use Repurposing Engine (CURE). Sheils received a B.A. in philosophy from the University of Maryland, Baltimore County, in 2005, and a B.S. in computer science from the University of Maryland, University College, in 2014. As part of his undergraduate studies, Sheils worked on developing a system to help coordinate humanitarian aid throughout the world. Sheils focuses on Web development, data curation and registration systems.